As a wine Champagne above all, has a legendary status. It is a drink favoured to celebrate weddings, births, anniversaries, and one that confers special status on the drinker. A certain ostentatious and very wealthy demographic can be heard to boast that they ‘only drink Champagne’, a phrase that is designed not to as an admission of alcoholism, but as an indication of high class. Whilst this sort of attitude was once associated with swinging aristocrats (see Hemingway’s characterisation of ‘Brett Ashley’ in Fiesta: The Sun Also Rises), it is fast extending to the glut of highly paid new financial City workers, and, amongst others, U.S. Rap stars! With so many other sparkling wines available worldwide, one might wonder what affords Champagne its unique status (and price). It would seem that this has developed over the years due to advanced marketing, particularly as the aristocratic links were hyped up.The Champagne region also has the Advantage of having been at the forefront of the Sparkling Wine market for most of its history. Like so much in the history of winemaking, Champagne came about by dint of steady trial and error and due in part to the limitations of terroir in the Champagne region, not to its strengths. Century’s long rivalry with nearby Burgundy left vintners in Champagne scratching their heads and wondering precisely what to do with their grapes, in light of the fact that they just couldn’t compete with the favourable growing conditions bestowed upon the monks of Burgundy. Various myths abound as to how precisely Champagne came about. Whilst it would seem that that monk Dom Perignon had a hand in the development of Champagne, it seems unlikely that he invented, sparkling wine itself. The English were making Sparkling wine some thirty years before the French – using cheap imported wine from the Champagne region. Many of the advances in Champagne production came about as a means of reducing the sparkle: Finding this to be impossible Dom Perignon turned the bubbles to hid advantage. All sparkling wine is produced by a secondary fermentation of, whereby the wine is further developed in the bottle by adding both yeast and rock sugar. The sediment is then removed by freezing and extracting the contents in the neck of the bottle (which is stored upside down), or by slowly turning the neck of the bottle and filtering the sediment. The laws governing the production of Champagne were drawn up in the treaty of Madrid in 1891, and re-established in the treaty of Versailles in 1919. These laws make it illegal for anyone else in the Europe to call their wine produce Champagne. There are similar laws applicable throughout the world, except in some circumstances in the USA. The U.S.A did not ratify the treaty of Versailles, forming their own peace time treaty with the Germans instead! This seemed to matter little as the U.S. were shortly to ban alcohol consumption. However, when this ban was lifted some American wine producers relied on this legal loophole. These days, however, sparkling wines outside Champagne tend to use the term méthode traditionelle or méthode champenoise upon their labels to avoid confusion. 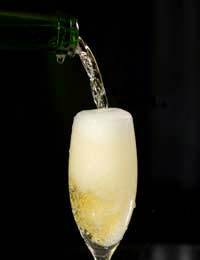 Many producers are in fact fully confident of the quality of their sparkling wine and have no desire to compare it to Champagne (see related article). It would seem overall that the special status that Champagne has been accorded is linked to a long history of experimentation within the Champagne region, and to the carefully cultivated terroir there (although it might be countered that these same condition can be found elsewhere. Additionally, it has enjoyed a status as the ‘drink of Kings’, aristocracy and movie stars.